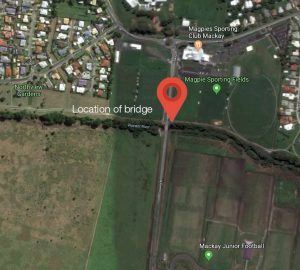 Motorists travelling along Glenella Road in Mackay may pull over and let this pedestrian bridge pass! In the brightest fire-engine red, this modified Murray Bridge could be easily mistaken when glancing in the rear vision mirror. Built in an area populated by several sporting clubs, the bridge provides a safe pedestrian crossing, where previously a hazardous trip across the two-lane, fenceless traffic causeway was required. The bridge is 21 metres long with a 3.1 clear width, designed to 5kpa loads and a maximum 2.5m/sec flood load. Landmark coordinated all engineering of the bridge, including soil tests, production of a geotechnical brief, and certification by a structural engineer. 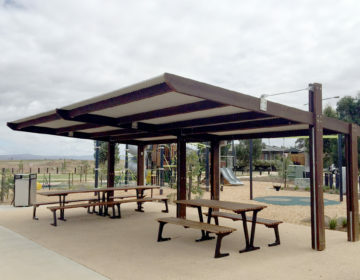 The bright bridge includes hot-dipped galvanised baluster panels, bike and kick rails and 1.5 metre lead on panels with inground posts. The decking is open-grid FRP (fibre reinforced plastic), allowing debris to pass through, thus reducing maintenance. The bridge, which was installed by Landmark, was delivered in kit form on site, assembled and then lifted into place.